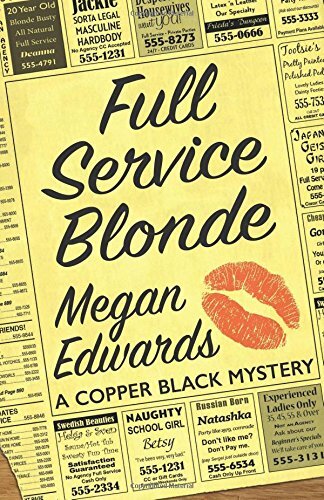 “Full Service Blonde” is the second book in the Copper Black Mystery series by Megan Edwards. Fresh out of college, gorgeous Copper Black has relocated to Las Vegas with the hopes of getting her journalism career going. Intrigued by the opportunity to interview a prostitute from a brothel, named Victoria, Copper jumps at the chance. Shortly after Copper attends a pagan ceremony with her, she is dismayed to discover that Victoria has been murdered. To solve the mystery of who murdered Victoria, Copper enlists the aid of an attractive coworker named David. After her apartment is ransacked, she finds herself really needing his help. Her attraction to David can't go anywhere, because her boyfriend is heading to town for the holidays, which they are going to share with Copper's family. Things get even more interesting when she discovers that someone is trying to screw a family member over in a business deal. She also learns something about her parents that has a huge impact on her relationship with them. Copper has a lot to juggle all at once. Unfortunately, something is going to have to give. I loved this fast-paced murder mystery. Full of eccentric characters and twists in the storyline, “Full Service Blonde” provides the reader with a great escape to Las Vegas, without having to get off the couch. I loved how the author managed to keep me on my toes with unexpected surprises. The characters are quite entertaining. Giving Copper two hot men in her life also added to the fun. Even if she chose to be faithful, the sexual tension was still obvious and totally enjoyable. Being that it is known as Sin City, Las Vegas is the perfect setting for this adventure. “Full Service Blonde” by Megan Edwards is a prequel to “Getting Off on Frank Sinatra,” in the Copper Black Mystery series. I would recommend getting both books so that you have the next one ready to go. I wish I did! I also recommend this book for a reader's group. It will definitely stimulate some lively conversations!